Top Boeing customer Norwegian announced at Farnborough that it will fly the Airbus A321LR on transatlantic routes and to Asia. The relentless accumulation of A321neo orders this year unexpectedly accelerated at Farnborough, underlining Boeing's lack of competitiveness at that large end of the single-aisle jet market. Airbus and Boeing are each emerging from the Farnborough Air Show with significant worries. For Boeing, it’s a growing orders gap. The final Air Show jet order tallies show that Airbus outsold Boeing by a large margin. For Airbus, it’s production issues. On the sidelines of the Show on Wednesday, Airbus chief executive Fabrice Brégier acknowledged the possibility of an accounting charge this quarter because of delivery delays on the A350. Boeing’s sales worry is largely down to one specific Airbus airplane, the A321neo. The relentless accumulation of A321neo orders this year unexpectedly accelerated at Farnborough, underlining Boeing’s lack of competitiveness at that large end of the single-aisle jet market. While Boeing’s rival plane — the 737 MAX 9 — received no orders at the Show, Airbus landed a huge AirAsia order for 100 A321neos. 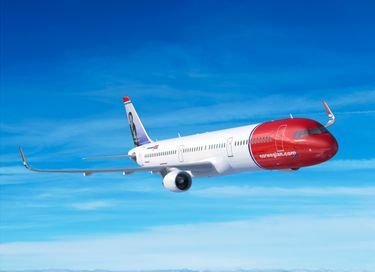 And on the last business day of the Show, Norwegian — a big Boeing and 737 MAX customer — endorsed the A321neo and said it plans to fly the long range version starting in 2019 on transatlantic routes and from Europe to Asia. A larger MAX that could fly around 240 passengers about 4,000 miles, the MAX 10. A “middle of the market” airplane that could fly up to 270 passengers with a longer range of about 5,500 miles, also called the New Mid-market Airplane. But neither of these is firmly launched and if Boeing does decide to go ahead, the earliest of the two, the MAX 10, wouldn’t enter service until 2021. In an interview earlier at the Air Show, Norwegian chief executive Bjorn Kjos had said he wasn’t interested in Boeing’s proposed MAX 10. On Thursday, it became clear why. Norwegian is a big Boeing customer. It flies 101 Boeing 737s and 10 Dreamliners and has firm orders for 22 more current model 737s, a further 32 Dreamliners, plus 108 Boeing MAXs. But it also has an order for 100 Airbus A320neos. On the final business day of the Air Show, Norwegian announced that it will convert 30 of those A320 orders to a long-range version of the larger A321neo, designated the A321LR. At Airbus’s closing press conference Leahy welcomed Norwegian’s decision as proof that the A321LR, not Boeing’s various new airplane proposals, is the perfect “middle of the market” airplane. “We’re glad to see a big Boeing operator agrees with us,” Leahy said. Asked to address the weakness of the MAX 9, Boeing marketing vice president Randy Tinseth doggedly kept switching the focus to production, where Boeing currently has the edge. Airbus always makes a splash at Air Shows and typically announces more orders than Boeing. At Farnborough this year, the final tallies showed Airbus with 197 new firm orders worth just over $25 billion at list prices, though according to market data provided by aircraft valuation firm Avitas, the real value is estimated at about $11 billion. Boeing had just 19 new firm orders, listed at $3 billion, though with a real value of about $1.5 billion. Both jetmakers also had reasonably reliable commitments from airlines that signed agreements for future orders. Adding those in, Airbus has 279 new orders and committments worth about $34 billion at list prices and with a real market value of about $15.2 billion. Boeing has 135 new orders and committments worth about $20.5 billion at list prices and with a real market value of about $9.8 billion. Yet Airbus’s week was not easy as executives addressed questions about this year’s production problems on the A320 and A350 programs. At an investors conference on the sidelines of the Air Show Wednesday, Brégier said that the engine problems that have held up A320neo deliveries are “behind us” and that the company is “making progress” on the cabin interior supply chain issues with the A350. Yet that progress is “not yet at a speed that I expect,” Brégier said. Airbus chief financial officer Harald Wilhelm acknowledged “there is a risk” of an accounting charge because of the A350 delivery delays. The previous evening, Airbus announced that lack of orders will force it to cut production of its A380 superjumbo jet from 2.5 per month today to one per month in 2018. Bregier insisted that the A380 will still have a future and that this rate reduction will help it survive until a market develops. He said that following a stringent cost-cutting program, the breakeven point in 2017 for the A380 will be delivery of 20 aircraft. He said cost reduction will continue in an effort to reduce the breakeven point as close to 12 aircraft as possible. In other words, Airbus will likely lose money on the A380 making just a dozen in 2018. Fortunately for Brégier, the Air Show sales story was sunnier. A week ago, before the Air Show, Boeing was ahead in the annual jet sales race. It had booked 302 firm orders for the year to Airbus’s 183. At the end of the Air Show, Airbus has 380 firm orders, while Boeing has 321.